The only way to cross this bridge is to fix the rope on one end, walk on the rope very carefully, and fix the rope on the other end so the Toad can cross. The Airway is a room inside of the Secret Mine in Luigi's Mansion: Dark Moon. The Airway is accessed by taking the elevator inside of the Chalet or by taking the door on the left inside of the Terminal. The Airway is a large room with a zipline system. There is a bridge that connects the two parts of the Airway while a constant wind is blowing through the area. The door on the top right leads back to the Terminal while the door on the bottom right leads to the Basin. The door on the left side leads to the Crossroads and the elevator leads to the Chalet. During Cold Case, Luigi needs to use the elevator in the Airway to reach the Chalet. However, when Luigi gets to the Airway, the zipline is on the other side, so Luigi must use an alternate way to reach the area. A nearby key can be obtained by throwing Toad into the elevator. After reaching the Airway via the Basin, Luigi must fix the bridge by pulling on the ropes to straighten it out. After pulling one rope, Luigi must use the raised half like a tightrope so he can pull the other one and be able to cross normally. Once the bridge is able to be crossed normally, Luigi must take the Toad assistant to the elevator and into the Chalet. In Hit Rock Bottom, Luigi must go to the Airway to go to the Crossroads. 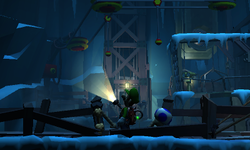 In Across the Chasm, Luigi can use the zipline in the Airway to reach the Terminal, where the entrance to the Gondola is found. Starting on Cold Case and most missions after, if Luigi enters through the door from the Terminal or uses the zipline to get to that door, there is a pair of binoculars on a stand nearby. If Luigi looks through the binoculars, he notices a bat grabs a sapphire and drops it in a barrel near the elevator. Inspecting this barrel allows Luigi to obtain the gemstone. This page was last edited on March 25, 2019, at 17:55.